DEFRA Protection Order centre point. A contained four-site outbreak of foot-and-mouth disease in the United Kingdom was found by regular livestock testing by the Department for Environment, Food and Rural Affairs (DEFRA), namely in August 2007 three times, and once the following month, all in the west of Surrey, England. The first diagnosis took place in a field of Normandy, Surrey; the second was three days later in a cattle-rotation field of the farmer in Elstead, and the following day nearby, a third infection within a quickly-established protection zone around the first incidence. One month and ten days after the first diagnosis a final incidence of 2007 was identified and dealt with 13 miles (21 km) north of the first diseased animal. The source of the strain released and contained in Surrey in 2007 was the advanced effluent pipes from either the Institute for Animal Health or the similar vaccine researching and producing Merial Animal Health laboratory near to Pirbright village in the county — the pipes were too old and/or insufficiently inspected given their importance. An inspection of the effluent pipes and manholes carried out for the HSE investigators showed deficiencies and the independent investigation of Professor Brian Spratt concluded that it was very likely that they occasionally leaked still-infectious effluent at the time of the outbreak. Both laboratories, either of which may have been the cause, upgraded and repaired their effluent treatment systems to continue operation. The UK Government provided compensation for the farmers directly involved. These interrelated and contained events prompted precautionary measures of restricted-access containment zones in three counties where suspected infections were reported and major international trading partners such as Canada and the Republic of Ireland placed temporary restrictions on meat and dairy exports. The field in which the infected cattle were grazing immediately before testing positive for foot-and-mouth disease. One of the many foot paths closed in an attempt to stop the spread of the disease. Symptoms were first reported late on 2 August 2007 on farmland in Normandy in Surrey, which was subsequently isolated and placed under restrictions. The site was a field for beef fattening rented by Derrick and Roger Pride. The previous confirmed epidemic of foot-and-mouth disease in the United Kingdom was in the spring and summer of 2001; it caused a crisis in British agriculture and tourism. The epizootic saw 2,000 cases of the disease in farms in most of the British countryside. Livestock farmers' losses and their interest remained acute – a negative testing in January 2007 in Northern Ireland received BBC local headline coverage. The following day the Chief Veterinary Officer (CVO) Debby Reynolds confirmed that initial testing revealed that 60 cattle were infected with foot-and-mouth disease and that other potential cases were being investigated. On the 4 August the virus was identified as the FMDV BFS 1860 O1 1967 (Foot-and-Mouth Disease Virus, British Field Strain 1860, serotype O, subtype 1, isolated in 1967; also referred to as strain BFS 1860/UK/67 ), a virus isolated in the 1967 outbreak and until the 2007 outbreak, not in circulation in animals. It was the same strain as used at the nearby Pirbright laboratory site, which houses separate units of the Institute for Animal Health and Merial Animal Health Ltd at Pirbright, 2 1⁄2 miles (4.0 km) away, which was identified as a possible source of infection, as it is one of only four European laboratories authorised to handle that strain of the virus to produce vaccines, the next nearest being in Belgium. As a result, the isolation zone was extended. The laboratory carries out research into foot-and-mouth disease (FMD) as well as other diseases affecting livestock. On 5 August another protection zone was created near Elstead after a cow at one of the two other locations used by the farm tested positive. The herd at both locations had already been slaughtered the previous day as a standard precautionary measure. On 6 August another herd within one of the protection zones showing symptoms of FMD was slaughtered on suspicion. Samples underwent analysis and on 7 August FMD was confirmed on a farm in Surrey within the protection zone. The cows were on land owned by farmer Lawrence Matthews who rented grazing to a neighbouring producer. "Subject to the ongoing work detailed above, the indications are that there is a strong probability that the FMDV strain involved in the farm outbreak originated from the IAH or the Merial sites." "We are further exploring the meteorological data, but at this stage, we consider there to be a negligible combined likelihood that there was an airborne release from the IAH or the Merial sites which was subsequently transferred to the first affected farm between the 14 and 25 July 2007." "Waterborne release onto the site remains a possibility. But preliminary investigations into the possibility of whether surface water from flooding from the site could have reached and contaminated the affected farm have indicated that this was negligible due to the distance, topography and direction of flow. These issues are being investigated further." The Pirbright site has been the source of foot and mouth outbreaks before - in 1970 the virus escaped from the experimental area into a holding pen elsewhere on the site. 18 animals had to be destroyed. On 9 August, a farmer who let the land at the site of the second outbreak reported some cows on his own farm to DEFRA as a precautionary measure. A 3 km Temporary Control Zone was established, and then removed, on August 11 when negative test results were returned. Three further potential outbreaks were investigated during August, at a farm elsewhere in Surrey; at the Chessington World of Adventures zoo; and at a farm near Romney in Kent. All three tested negative for foot and mouth. On 24 August, following a lack of further outbreaks since the initial discovery, Defra lifted the protection zones around the farms. On 8 September the surveillance zone was removed. 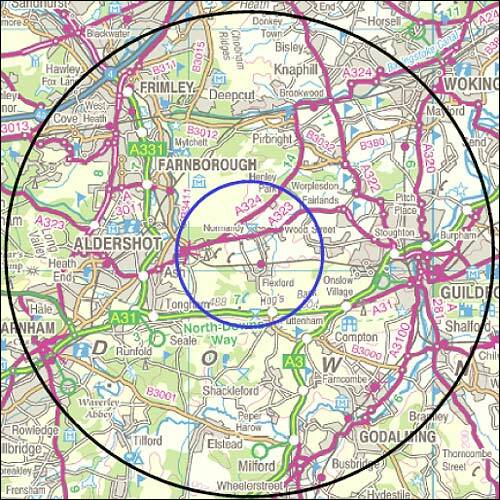 A 5 km radius Biosecurity Area remained in place longer around the Pirbright laboratories. On 12 September a new case of foot and mouth was found 30 miles (48 km) north of the original case at Milton Park Farm near Egham in the county. A 3 km radius Protection Zone and a 10 km radius Surveillance Zone have been established around the farm. A sick sheep found earlier during the day in Scotland at a Lanarkshire market was later found to be negative. Separately, a Temporary Control Zone was put around a premises in Norfolk as a precautionary measure following a veterinary visit. Laboratory results for these animals were also negative and so the local restrictions were lifted the next evening. All livestock at the 3 geographically separate locations were destroyed on 4 August. A nationwide ban on the movement of cattle and pigs was imposed, with a 3 km (1.9 mi) protection zone in place around the affected farm and a further 10 km (6.2 mi) zone of cattle surveillance. An 8 km (5.0 mi) aerial exclusion zone was set up around the site. Following the confirmation of the outbreak, Northern Ireland and the Republic of Ireland closed all of their ports to livestock, fresh meat and non-pasteurised milk imports, and have ordered disinfectant measures to be put in place at ports and airports all over the island. Canada blocked the entry of any livestock from the United Kingdom (including, for the moment, Northern Ireland) into the country, and Japan and the United States have blocked the entry of pigs and pig products. British beef is already banned in both of these countries. On the prospect of the virus emanating from one of the Pirbright establishments, emeritus professor of bacteriology Hugh Pennington was quoted as saying, "If we know exactly where the virus has come from, and particularly if it's a vaccine type of virus, it's less likely to be a nasty virus." Dr King, a former head of molecular biology at the IAH, was quoted in The Times as saying "As far as I am concerned the authorities have failed to find any chink in the armoury of the establishment’s bio-security. What you are left with is human movement, which is not a matter for the institute, it’s a police matter. It’s very, very unlikely that it could be spread by accident. People do not spread the disease easily." The Prime Minister Gordon Brown and Environment Secretary Hilary Benn returned to London early from their holidays, in a story broken by BBC News journalist Gary O'Donoghue that in turn led to accusations of discrimination against the BBC. Welsh Minister for Rural Affairs Elin Jones cut short her holiday to New Zealand, and opposition leader David Cameron also cancelled his holiday in Brittany. A COBRA meeting took place shortly before the official announcement, with the Prime Minister participating on a telephone link. A report into the epidemic was released on September 5. It reported that traces of the virus were found in a pipe at the Pirbright institute running from Merial to the government's treatment plant. It is thought that tree roots damaged the pipe allowing the virus to the surface. The report hypothesises that site workmen conveyed the virus to the Normandy farm en route home from work. The council may not have been able to prove beyond doubt whether the Department for Environment, Food and Rural Affairs (Defra) licence conditions had been breached. This was particularly because the two laboratories shared the drainage systems under those conditions. ↑ "Foot and Mouth Disease confirmed in cattle, in Surrey". DEFRA. 2007-08-03. Archived from the original on 2007-08-19. Retrieved 2007-08-03. ↑ "Further farms tested for disease". BBC News. 2007-08-04. Retrieved 2007-08-04. ↑ David Smith (2007-08-05). "How the dark shadow of disease fell across Surrey". London: Observer. Retrieved 2007-08-07. ↑ Adam Lusher; Andrew Alderson (2007-08-07). "Farm at centre of foot and mouth is 'well-run'". London: Daily Telegraph. Retrieved 2007-08-07. ↑ "Pigs are clear of foot-and-mouth". BBC News. 2007-01-09. Retrieved 2007-08-04. 1 2 "Farm infected with foot-and-mouth". BBC News. 2007-08-03. Retrieved 2007-08-03. ↑ "Map of Isolation zones(Image)". BBC News. 2007-08-03. Archived from the original on 7 August 2007. Retrieved 2007-08-04. 1 2 Miles Goslett (2007-08-03). "Foot and mouth: new possible cases reported". London: Daily Telegraph. Retrieved 2007-08-04. ↑ Carrillo C, Tulman ER, Delhon G, Lu Z, Carreno A, Vagnozzi A, Kutish GF, Rock DL (2005). "Comparative genomics of foot-and-mouth disease virus". J. Virol. 79 (10): 6487–6504. doi:10.1128/JVI.79.10.6487-6504.2005. PMC 1091679 . PMID 15858032. ↑ "Results of Foot and Mouth Disease Strain in Surrey, extension of zones". DEFRA. 2007-08-04. Archived from the original on 2007-09-27. Retrieved 2007-08-04. ↑ "EU "Council Directive 2006/552/EC concerning laboratories to handle FMD virus". ↑ "Foot-and-mouth strain identified". BBC News. 2007-08-04. Retrieved 2007-08-04. ↑ DEFRA – "Declaration amending the declaration of a protection zone, surveillance zone and restricted zone made at 21:30 on 3 August 2007"
↑ "INSTITUTE FOR ANIMAL HEALTH". Archived from the original on 2007-08-21. ↑ "Foot and Mouth Disease confirmed in Surrey". DEFRA. 2007-09-12. Archived from the original on 2007-11-03. Retrieved 2007-09-12. ↑ "BBC NEWS | Scotland | Perthshire sheep given all clear". News.bbc.co.uk. Retrieved 2008-10-27. ↑ "Foot and Mouth Disease confirmed in Surrey". DEFRA. 2007-09-12. Archived from the original on 2007-11-11. Retrieved 2007-09-12. ↑ "Foot and Mouth Disease confirmed in Surrey:Update: 21:50, 13 September". DEFRA. 2007-09-13. Archived from the original on 2007-09-15. Retrieved 2007-09-14. ↑ "Everything In Our Power To Eradicate Foot-and-mouth, Says Prime Minister, Gordon Brown". Medical News Today. 2007-08-04. Archived from the original on 11 August 2007. Retrieved 2007-08-05. ↑ "All-island response to foot-and-mouth threat". BreakingNews.ie. 2007-08-04. Retrieved 2007-08-04. ↑ "Disinfectant measures ordered at ports and airports". BreakingNews.ie. 2007-08-04. Retrieved 2007-08-04. ↑ "British livestock exports banned". Toronto: theglobeandmail.com. 2007-08-04. Archived from the original on September 30, 2007. Retrieved 2007-08-05. ↑ "Disease labs face safety inquiry". BBC News. 2007-08-05. Retrieved 2007-08-05. ↑ Smith, Lewis; Pavia, Will (2007-08-10). "Fresh outbreak of virus suspected as scientists point to sabotage as cause". London: The Times. Retrieved 2007-08-10. ↑ Revoir, Paul (2008-09-07). "Five-figure payout for BBC reporter taken off the TV news 'because he was blind'". London: Daily Mail. Retrieved 2008-09-07. ↑ "Abattoir lay-offs after outbreak". BBC News. 2007-08-06. Retrieved 2007-08-10. ↑ EPUK - Foot & Mouth photographer guilty . Accessed 2009-04-30. Archived 2009-05-18.